The ACA is proud to recognize certified instructors who have gone above and beyond, and who are making significant strides in their communities and to the sport of paddling overall. Tosh Arwood’s life is whitewater. His career revolves around his true passion for whitewater, and he has the ability to share that passion with others. Arwood began his career at the Nantahala Outdoor Center in its retail organization as paddlesports product manager. In that capacity, he was responsible for all paddlesports product offerings, ordering and replenishment, and sales in the NOC Outfitter's Store, where he controlled millions of dollars of inventory. Arwood was then promoted to paddling school manager, where he oversees the largest whitewater paddling school in the world. He holds numerous certifications, including Wilderness First Responder, ACA Kayak Instructor Level 5, ACA Swiftwater Rescue, Rescue 3 Swiftwater Rescue Technician-A, and Whitewater Rescue Technician-A. Most recently, Arwood went on a self-support kayaking trip with other NOC guides down the Grand Canyon. His favorite NOC adventure is Adventure Travel to Chile. “I have been fortunate enough to spend multiple winters in South America, between Ecuador and Chile,” said Tosh Arwood. “I have facilitated everything from exposing unknowing locals to the amazing resources in their own back yard, to providing my students from the U.S. the opportunity to paddle in the warmth of winter in the southern hemisphere, progressing as paddlers. In each case, seeing the confidence and growth gained is extremely rewarding. I’m pretty much living the dream,” he added. One of the more remarkable aspects of teaching for Arwood is how paddlesports bring people together. Josh Oberleas has worked at the Rocky Mountain Outdoor Center for nine seasons as a raft guide/instructor, kayak instructor, and SUP instructor. 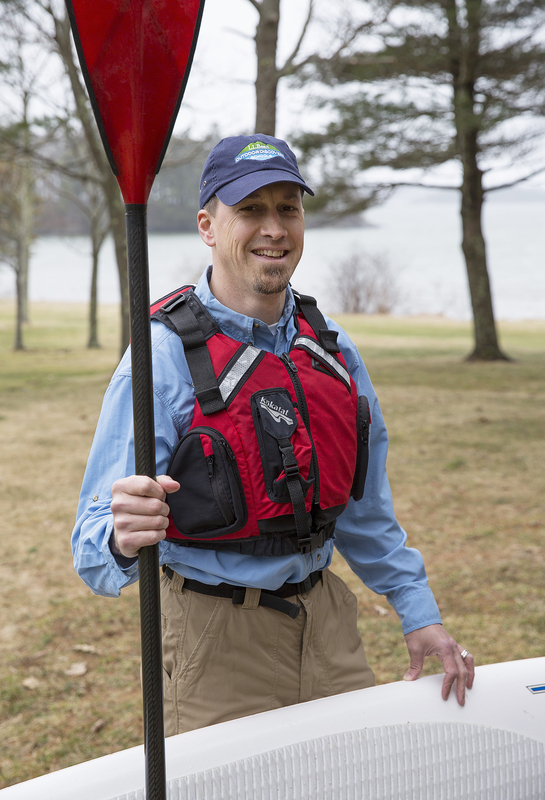 He has been an ACA instructor since 2006 and a kayak instructor trainer for four years. As a raft guide/instructor, he has worked on the Arkansas River in Colorado with the ACA Pro School Rocky Mountain Outdoor Center in Buena Vista, Colorado. He enjoys teaching new guides and showing people the beauty of the river. Oberleas studied Outdoor Leadership and Geology at Western State Colorado University in Gunnison, Colorado. He has been visiting Chile since 2007 when he first went with his school. He began working in Chile on the Maipo River and then in Pucon as a safety kayaker and raft guide. In 2014 he completed his IT training and decided he wanted to share his knowledge in South America. Since then, he has conducted several courses in Chile and Brazil. “My goal was to share the information that was still fairly unknown [in South America]. After the first course the students were fascinated to learn about so much and the progression of teaching in South America. There is a lot of interest here, and the ACA has a beautiful and reputable name,” said Oberleas. After that positive feedback, he started offering courses and spreading the ACA in South America. He has had students from all over South America, Europe, and the United States. The most eye-opening experience Oberleas has had while teaching courses has been realizing there was no formal instruction in Chile. Most kayakers learned from their friends. Essentially, they would learn the roll and then go to the river. “Showing them that there is another way to learn/teach has exploded this sport here and I am honored to have helped accelerate the growth of kayaking and rafting in South America,” Oberleas said. With Spanish as a second language, Oberleas has found teaching to be a great challenge, but also a very rewarding undertaking. “In Chile it is amazing to be guiding on the Trancura River in Pucon. It’s a different type of river to run, and you learn a lot from how people in other places in the world run rivers,” said Oberleas. “I am one of the lucky ones who can say that her entire life revolves around her biggest passions,” said Jessica Amendola, founder of SUP Yoga Center. Just a couple years ago she took the plunge and decided to become completely self-employed and create her dream life, following her heart and turning her passion into her business. She opened her first SUP Yoga Floating Studio on the beautiful island of Maui. Moving back home to Florida in 2016, she brought her business with her. Amendola is an ACA-certified Standup Paddleboard Instructor, Yoga Alliance registered E-RYT200, certified SUP Yoga Instructor, BOGA Yoga Ambassador, and she brings over a decade of experience as a practitioner and expert instructor. She teaches SUP and SUP yoga classes that are inspired directly from her time in or around the ocean. Her classes are a blend of challenging movements, interwoven with spirituality and a heavy emphasis on alignment of the body and movement with breath. The purpose of her classes is to help guide her students into living a life of purpose and passion, finding peace of mind and strength of body. “The most incredible thing about paddling to me is being so perfectly connected to our beautiful planet. I love lying on my paddleboard after a SUP Yoga class, with my hands dangling in the water, feeling as if my body is just floating on earth. My years on the water have inspired me to take action in reducing my carbon footprint, making a positive impact on our planet, and in turn inspired me to take even better care of my own body. You have two homes to take care for: your body and your planet. Every single time I am on the water, my passion to take care of both is renewed,” she added. Sean Podrecca has been kayaking since 2005 when he went on his first trip through his university’s outdoor recreation program. He quickly took to it, becoming a raft guide in North Carolina for two summers before heading to Colorado where he not only raft guided but became an ACA whitewater kayak instructor in 2008. He has worked with many different paddling programs since then, including managing two chapters of Team River Runner (a nonprofit for wounded veterans), First Descents (a nonprofit program for young adults with cancer), the National Outdoor Leadership School, and both the US Army and Air Force, with whom he is currently employed. Tommy Gram has over a decade of experience teaching people to have fun and be safe in the outdoors. He lives in Buena Vista, Colorado, where he works and plays outdoors as much as possible. When asked how he keeps sharp in the off season, Gram said, “Luckily there is always a bit of water in the Arkansas River Valley that makes running slalom gates and low water runs possible to keep my paddling skills sharp. I spend a lot of time skiing in the backcountry, which translates to keeping my thinking and decision-makings skills sharp.” In the winter, Gram is a backcountry ski guide for Buena Vista Mountain Adventures and an avalanche instructor for the American Institute for Avalanche Research and Education. He currently is an L4 Whitewater Kayak and Swiftwater Rescue Instructor Trainer, an L5 Advanced whitewater Kayaking Instructor as well as a Wilderness First Aid Instructor. Gram is the program director and lead guide/instructor for the Rocky Mountain Outdoor Center.He is also the owner/operator of Whitewater Attainment, where he provides instructor certification and advanced level training for kayak schools, clubs and other organizations in the western states. “Whitewater Attainment was started in 2015, and provides Instructor Development and Instructor Certification Workshops as well as high-end coaching and clinics throughout the western states. Over the last few years I have met some awesome people and gained some great experiences,” he added. Paddling has been a part of Walter Felton’s life since he was a small child. “My family would go to local Arkansas rivers for day trips and that grew into a passion for paddling,” he said. By the late 1980s Felton decided that he wanted to explore more difficult whitewater and purchased a kayak. He then joined the Arkansas Canoe Club. He soon discovered that he loved the open boat more and begin taking ACC and NOC classes for open boating. “By the early ’90s I found myself unwittingly thrust into an open boat teaching role for the local club and realized I needed to know a lot more if I was going to teach for the Arkansas Canoe Club,” he said. In that same time frame the ACC started engaging the ACA instructor program and he joined in. “My teaching and learning about teaching has grown from a desire to support the Arkansas Canoe Club, to a passion for sharing knowledge about a sport that I love,” Felton added. By the late 1990s Felton was paddling Class IV whitewater and helping with swift water rescue workshops around the state. He had realized that he needed to know how to get himself out of trouble and how to support his paddling group if they had a problem. “That drive for knowledge led to my first certification as a SWR instructor and sharing SWR skills grew into a passion for developing new teaching ideas and SWR techniques,” he said. Felton said his development as an instructor has been influenced by several people, many in the Arkansas Canoe Club and several from the ACA, most notably Sam Fowlkes and Robin Pope. “These mentors taught me how to teach people first and then how to offer the various skills to those people. Teaching in this sport has been a life journey,” Felton said. Brendan Fitzpatrick’s obsession with fly fishing led him to become an ACA instructor. Fitzpatrick is the most active instructor using the ACA Paddlesport Safety Facilitator program in his region. “The Paddlesport Safety Facilitator endorsement has served me well over the past two years. It is most popular with organizations (e.g., Girl Scouts) that require more than a skills course, but find the commitment and pricing of a multi-day ICW inconvenient. At CKAPCO we were able to slightly modify our beginner kayak course to include the additional safety and rescue topics of the PSF and certify folks to evangelize paddling at their facilities. The written exam has actually proven to be a fun way to see if students are retaining the information we teach,” said Fitzpatrick. Currently, Fitzpatrick is an Instructor Trainer candidate in whitewater canoeing. His near term goal is to complete that process and then work on becoming an IT in whitewater kayaking. “My longer term aspirations are to get my four kids to fall in love with paddling and join me on paddling adventures. It would also be nice to be a full-time guide or instructor when I finally retire,” he added. When it comes to paddlesports, spending time with friends and family and just being on the water with them either kayaking, playing canoe polo or paddleboarding are the most precious and exciting moments for Ge Wu. Canoe polo was Wu’s first experience with paddlesports. The sport has taught him a lot about self-determination, working as a team, and working hard to win. Since 2011 he’s been playing on the USA Men's Kayak Polo Team, and he treasures this honor and opportunity to represent the country and play against the best players and teams around the world. Apart from playing canoe polo, Wu also finds time to compete in whitewater, SUP and dragon boat races. However, this year he hasn’t been able to play as many tournaments as he did in the past. Now he’s dedicating more of his time to coaching others to prepare for and compete in such competitions. In May, the student canoe polo team from Zhejiang University that he had been coaching competed in 20th International Canoe Polo Amsterdam Open, and they finished third. “I couldn't have been more proud of these kids. They all had just started to learn canoe polo no more than a year prior to the competition,” said Wu. As an international ACA Instructor, Wu travels quite a bit. He uses these experiences to strengthen his local paddling community. “Wherever I go paddling, I take pictures of the local infrastructure, the facilities, the waterways and the local paddlers. And when I get home, I show these pictures to my fellow paddlers and share what I've learned from these trips. I think there's always a thing or two that our local paddling community can relate to or learn from another community that may be thousands of miles away, especially when my young local paddling community and the entire paddling community in China just kicked off a few years ago,” said Wu. He gets asked a lot by fellow Chinese paddlers to help them translate teaching and learning materials, or help them pay their ACA dues because they can't read English, or help them decide which gear to buy, or help them get in touch with a club in another country. “I absolutely enjoy doing all of these, because it can help my local paddling community mature and stay connected with wider international community. I think globalization is definitely in our paddlesports, too,” he added. “We also do local events with several of the Cross Fit gyms who use bellyak in their weekly workouts to mix up their fitness routines. We are always looking for creative ways to get more people on the water,” he added. “As a lifelong kayaker, I had forgotten how big of a barrier to entry the kayak roll is, and how much instruction early on focuses specifically on what to do if you’re upside down. What we’ve found is that there is a large community of people out there who want to experience the joy of whitewater but have felt limited by current options. We make it easy and exciting for them,” said Masters. “The best part of a bellyak is that everything feels exciting when you’re paddling prone and using your hands. There are those who have tried it, there are those who want to try it, and there is everyone else. We focus on our students, in making them competent, safe and knowledgeable paddlers. There is no substitution for quality instruction combined with experience over time,” he added. Dave Sibley has enjoyed more than 10 years participating in kayak training in various roles with the Wilmington (Delaware) Trail Club. The club has expanded its novice programs for both recreational and whitewater, and has added components such as Helper Training, swift water rescue and intermediate/advanced clinics like “Fun with Rocks” and “How to Lead on Class 4.” Instructors are mentored and encouraged to teach classes of their own design to take students beyond the novice training. Instructors also mentor trip leaders, so the club can offer trips on more advanced rivers. As a park educator with New York State Parks, Recreation, and Historic Preservation in the Niagara Region, Tina Spencer provides in-park and outreach programs to serve patrons in 16 state parks as well as local schools in her region. She also operates a seasonal nature center at Beaver Island State Park. Her work has rewarded her with many opportunities, including becoming a boater safety instructor through the NYS Marine Services Bureau and a certified interpretive guide through the National Association for Interpretation. Her love of the outdoors and the desire to teach led her to become a kayak instructor. Following NYS Park’s Commissioner Rose Harvey’s Strategic Goals and Priorities to increase, deepen, and improve the visitor’s experience, including recreational opportunities in NYS Parks, Spencer developed the Kayaking with Tina program that teaches Smart Start Paddling Orientation. In 2015 Spencer was honored with the Huttleston Special Achievement Award. She was recognized for supporting the commissioner’s goal of deepening and improving the visitor’s experience by initiating and developing a highly successful kayaking program in the Niagara Region of NYS Parks. Tied to living out her passion, Stockwell, an L4 Whitewater Kayak Instructor, founded Diverse Paddle Sports to educate other paddlers. She chose that name “because I want to encompass all of my paddle actives such as whitewater kayaking, outrigger canoeing and dragon boating because they give me the ability to evolve, both physically and mentally. This name also reflects and supports my personal belief system and encompasses many different groups and individuals.” Stockwell’s mission is to provide education to empower individuals with a passion for paddlesports activities. She strives to give back the knowledge she’s gained from instruction and through personal experiences. As part of this, Stockwell donates her time to others with this passion who are economically challenged and to a local youth program. Find out more about Jennifer’s amazing contributions to her paddling community in our newest edition of Paddle. Jeff Atkins is a 25-year veteran park ranger with South Carolina State and County Parks. He has led outdoor programs all over the state and is frequently found teaching at symposiums in the Southeast. As an instructor for the N.C. Outward Bound School, he leads expeditions around the U.S. Paddlesports is his passion and loves to spread the “infectious” recreation activity to others. He believes in having fun, learning, and helping others to expand their knowledge and skills. “There is nothing like the feeling of seeing a person smile because they just did something they didn’t think they could do,” he said. Atkins loves paddling in the ocean. “The energy of waves excites me. I also really love expeditions. The chance to see beautiful remote places that are not disturbed by development sooths my soul,” said Atkins. Mike is an ACA Safety & Rescue ITE, Rescue 3 Rope & Water IT. With more than 20 years to develop his judgment on and in the water, Mike Mather is one of the more experienced and entertaining rescue professionals in the industry. Having taught courses all over the U.S. and in Europe, Mike has an unconventional approach to this topic. Mike excels at keeping topics clear, accessible and applicable for rescue professionals, experienced boaters and novices alike. Kent Ford described Mike as a "highly skilled person, with a valuable set of skills, including guiding, guide training and broad national experience in swiftwater rescue. His experience level is truly unique on a national level.” A few of the teams Mike has trained to date include: USN Seals, USAF PJs, San Diego lifeguards, Los Angeles lifeguards, Eagle County Colorado FD, etc. Mike worked with Horst Fürsattel, the inventor of the rescue PFD in Germany, and tested the rescue harness by having the class haul him up an 8-foot ledge. Mike played the role of the entrapped victim in the film "Heads Up” multiple times and in one instance the rope snagged on the river bottom entrapping him for real. Mike truly is the "Houdini” of swiftwater rescue! For more beta on Mike, check out our most recent version of Paddle! Kelly Marie Henry is completely addicted to high-performance surf kayaking. “For me, surf kayaking is very challenging, a little bit terrifying, and pure joy. When I am up and riding, the background noise of life fades away and there is only silence. I am fully present in the moment on that wave. As the ride ends, the surge of positive emotions is overwhelming – I am grinning from ear to ear,” she explained. She enjoys instructing almost as much as surfing. “I find helping paddlers at all levels build their skills and increase their comfort and confidence on the water truly rewarding. Several years ago, I left a promising career in oceanography to work full-time in paddlesports,” said Kelly. She instructs introductory and intermediate sea kayaking, surf kayaking, and stand up paddleboarding through California Canoe & Kayak. Recently, she collaborated with several San Francisco Bay Area instructors to form River & Ocean Paddlesports Coaching. Henry enjoys promoting paddlesports participation, particularly among women. “The more time I spend in coastal kayaking and surf kayaking, the more aware I become of the lack of women in both disciplines,” she explained. Several times a year, she collaborates with the California Women’s Watersport Collective– an organization dedicated to creating and fostering a community of women who share a love of the water – to offer women’s specific sea kayak and surf kayak clinics and multi-day classes. Read more about Kelly Marie in our most recent edition of Paddle! Georgia Ackerman of Tallahassee, Florida, enjoys spending any day in the woods or on the water. She especially enjoys getting folks out on the quiet, pristine rivers and bays of north Florida far from the distractions of civilization. “I like exploring our area’s wooded river basins. I love floating around in the Gulf in a kayak, spotting pelicans and rays, just a small speck in the vastness of nature. And, I especially enjoy our magnificent spring-fed rivers. They’re exceptional,” she said. Read our full interview with Georgia in the most recent issue of Paddle! ACA: Please describe your activities with REI programs and events (or any other unique programs of which you are a part). ACA: Are there any places or people with which you still aspire to paddle? Stark: For a wilderness experience I would like to return to the Wind River, in the Yukon Territory, with family. For a more local aspiration I would like to complete Chicago’s Southside Circumnavigation, which involves ~60 miles, total, linking Lake Michigan, the Calumet River, the Cal-Sag Channel, the Sanitary& Ship Canal, and the Chicago River. Read the full bio, in Paddle Magazine! Malewski: I spend approximately 20 hours a week either on the water, in the water or thinking about the water. I’m either paddling, teaching, observing or developing courses. I learn from every level of paddler, both beginner and expert. I believe that good instructors are created by their students, mentors and peers. I have 4 co-instructors that I work with and learn from constantly – Scott Fraser, David Ford, Londa Irvin and Mat Perfitt; they make me better. ACA: Can you please describe your activities with Wounded Warriors programs and events? Malewski: I actively participate in the Team River Runner program, providing kayak instruction and training to wounded vets. I have participated in five Outta Sight Clinics in four states (visually impaired students) and also in several events with the VA. I work extensively with Camp Civitan, Heartwood school and Special Olympics to bring the kayaking experience to those with both cognitive and physical disabilities. ACA: What aspect of paddling is the most exciting and engaging to you? Approximately how much of your time do you dedicate to paddling (or thinking/training/dreaming about paddling)? Johnson: I absolutely love every single aspect about paddling! However if I had to choose one thing, the most exciting and engaging aspect of paddling is that it’s something people from a broad variety of abilities and ages can participate in. It’s a very simple sport to get involved in, with the entire family or a group of friends. I love the social side of paddling—it’s so much more fun with other people! My bachelor’s degree is in marine, freshwater, and environmental biology so I’m always looking for new ways to experience the outdoors. Read our full interview with Brooke in the September 2016 issue of Paddle! "I grew up surrounded by water. Born in Ponce, Puerto Rico and raised in a US Navy base in south Spain; Charleston, South Carolina; and Puerto Rico, it was inevitable that water would be a big part of my life. From scuba diving to surfing, I was always on the water. I was known to skip college to go fishing regularly. It wasn’t until early 2006 when I started kayak fishing that I traded my surfboard, snorkel and motorcycles and eventually, fishing poles, to dedicate all my free time to paddlesports. It’s possible one day I will trade my profession of professional photographer and live only to paddle. Paddlesports has become my healthy obsession. The rougher the water the more I enjoy it." Read our interview with Gil in the September 2016 issue of Paddle! Wu: Competing, whether kayak polo or kayak racing or dragon boating, gives me the most pleasure and makes me feel most at ease. It helps me test my skills and abilities, but also gives me the opportunities to observe and learn from other fellow paddlers. Hanging out and having a good time with these awesome and like-minded people are priceless to me. When not competing or training for competitions, my time is divided between designing lessons plans, kayaking programs, teaching kayak polo and giving ACA courses in China. Read the rest of our interview with Ge in the July 2016 issue of Paddle. Read the rest of our interview with Gerry in the July 2016 issue of Paddle. Paddling on the coast is where I feel at home. I am always checking the forecast and planning what I’ll be doing the next time I’m on the water. No matter the conditions, there’s always something I can do on the coast. Surfing, rock gardening, or open water storm paddles, I love it all and try to get out whenever possible. Read more about Bill in the May 2016 Issue of Paddle. Hutchison: For me, paddling is my favorite way to spend time outside. I love being able to explore any body of water: Oceans, lakes, rivers etc. I spent a great deal of time as a kid at the beach with my family. Now, instead of going to the beach, my wife and I grab our SUPs or kayaks and hit the water. Living on the coast of Maine provides so many places to paddle right outside our front door. Read the rest of our interview with Rob in the May 2016 Issue of Paddle. ACA: What aspect of paddling is the most exciting and engaging to you? Dominguez: This will have to be a two-part answer. First, as an Instructor Trainer for Canoe Touring I really enjoy the opportunity to mentor, teach, and develop new instructors. Seeing them develop increased confidence in their paddling skills and then being able to translate that skill into excellent teaching and modeling for their students keeps me coming back to instruction each year. Second, each time that I stand at a put-in to start a kayak or canoe camping trip, I always ask myself why I don’t make time to do this more often! Read the rest of our interview with Tina in the March 2016 Issue of Paddle. Reid: I really enjoy rafting. Having all your gear in your raft on an expedition trip is one of the most fun parts of rafting. Let the raft do all the heavy work and go on lightweight side hikes. I try to spend more time on the water than off the water. There is nothing more peaceful than sleeping next to the river. Read the rest of our interview with Travis in the January 2016 Issue of Paddle. Adler: Truthfully, everything about paddling is exciting to me. I spend a great amount of time thinking and planning how I can make paddling and coaching a larger part of my life. I have been paddling since ’98 and coaching for about 3 years, and the coaching has fueled my addiction. I find the greatest thrill in coaching is helping paddlers of all levels improve their skills. There is no better feeling than seeing the smiles that happen when a student obtains a skill that they have been trying to master. Read the rest of our interview with Jeff in the January 2016 Issue of Paddle. Only six women worldwide have pursued and achieved ACA Level 3 Whitewater Standup paddleboard certification and November’s Instructor of the month, Jill Wiest from Lykens, Pennsylvania, is one of those six women. Jill’s first experience on a SUP was in a class II-III downriver race on the Lehigh River in 2012 and she immediately became addicted, loving the extra challenge of not only navigating a rapid successfully, but stay standing on the board while doing so. Over the next two years, she immersed herself in the sport, attained L3 ACA certification, and grew her board collection to five including a slalom-specific custom board. Read more about Jill in the November 2015 Issue of Paddle. Crites: The most challenging and engaging part of paddling is being able to think on my feet. As water levels change, features in the river change. Just about every time I go out I face new challenges and it keeps me coming back. If I feel confident with paddling the river in my creek boat, I’ll change to my play boat or SUP and it becomes a new puzzle all over again. Read the rest of our interview with Katie in the November 2015 Issue of Paddle. ACA: What drew you to become an ACA Instructor? Kochevar: I became a Coastal Kayaking Instructor with the ACA after graduating from Northland College in 2005 with a degree in Outdoor Education. I had taken a position as a sea kayaking guide with Living Adventures Inc in Bayfield, WI. All the guides at Living Adventure are required to take the IDW as a part of their staff training. At the end of the summer, guides are invited and encouraged to attend the ICE in the fall if they think guiding and sea kayaking instruction is something they plan to continue. With my background in outdoor education, and my longtime love of paddling, becoming an Instructor seemed like a natural fit. Read the rest of our interview with Joe in the September 2015 Issue of Paddle. ACA: What is your favorite thing about being an ACA Instructor? Dortch: For me, the biggest reward that comes with being an instructor is seeing the transformation people experience when they get in a canoe. Seeing the joy on their faces when they paddle is the best. Read the rest of our interview with Dale in the September 2015 Issue of Paddle. Read the rest of our interview with Matt in the July 2015 issue of Paddle. ACA: What drew you to become an ACA certified Instructor? Read the rest of our interview with Carol in the July 2015 issue of Paddle. Born and raised around the water, Matt Hite's draw to becoming an ACA SUP instructor came to as surprise as he grew up in a family of long time ocean lifeguards and educators. Matt is an avid paddler, surfer, Level 3 SUP Surf Instructor, and also a level 2 SUP Instructor Trainer. He started paddling stand up paddleboards in 2008 and quickly became an instructor as the commercialized sport made its entrance into Florida. With a strong desire to be on the water whenever possible, Matt was immediately hooked as SUP filled the gap when there were no waves to surf. As soon as certifications were established, he took his love of the sport of SUP to the next level and became an ACA SUP instructor. Matt currently directs weekly classes and leads a growing club of over 1000 SUP enthusiasts in Jacksonville, FL. He also enjoys volunteering his time with several non-profits and coaching a Special Olympics SUP team. He is also a manager and head instructor at Black Creek Outfitters. Matt considers himself a true Florida waterman and is committed to sharing the excitement, safety, and knowledge of the ocean and riding its waves. I have always had a interest for being active, teaching, life-long learning, and community building - paddling has proven to be the perfect outlet for all of these interests! About six years ago, I became a volunteer Trip Leader with Venture Outdoors (VO) - a Pittsburgh-based non-profit who’s mission is to connect everyone to the great outdoors. It was here that I began to take an active role in supporting, organizing, and leading various group kayak outings around Pittsburgh - night time fireworks paddles, eco tours, full moon paddles, and longer endurance paddles. One thing led to another and I was asked to assist with VO’s ‘Intro to Kayaking’ and ‘Trip Leader Kayak Training’ programs. It was around this time that I began to seek out additional kayak training to continue my own paddling and teaching skills. The closest paddling school at the time was Exkursion Outfitters and that’s where I met ACA coastal instructors, George Ondish and Jesse Twichell. I took a few different courses from George and Jesse over the years - sea kayak touring, advanced strokes, open water navigation, and advanced rescues. Me in my clunky rotomold recreational kayak, fumbling around with a 5lb paddle - the dynamic duo, George and Jesse, with their composite sea kayaks, carbon fiber bent-shafted paddles - they made their boats dance on the water. I had to know how to do that too! I went on to complete my Adaptive Endorsement with John MacDonald, Joe Moore, and Elaine Mravetz in Ohio a year later. I am currently in the process of completing my Level 2 and Adaptive Paddling IT certifications. Thanks to all of those mentioned here (any the countless others who I met along the way), for being such great instructors, mentors, and ambassadors for the ACA and our sport! Charles "C.C." Williams, a native of Fort Mill, South Carolina is passionate about teaching and learning through the outdoors. A paddler and ACA instructor since 2005, he has spent the past three years teaching and guiding students of all levels as they discover the waterways of South Carolina. He is currently an Active Learning & Living (A.L.L.) Outdoors coordinator for the City of Rock Hill Parks, Recreation and Tourism Department, Level 4: Swiftwater Rescue Instructor, Level 3: River Kayak Instructor, and Level 2: Essentials of River Kayaking Instructor Trainer Candidate. Williams continues to renew and broaden his ACA instructor certifications because they help him to "provide the best possible learning experience for students to develop new skills and overcome challenges." "I love the work and seeing the progression of our students. Experiencing their enjoyment and confidence on the water is very rewarding. Marna Powell, one of my earlier instructors, taught me the concept of 'pay it forward' which encompasses the idea of passing on what we have learned to other paddlers. As an active member of the PAC, Explore North Coast Kayak Club (ENC), I have been presented with many great opportunities to instruct and share my paddling passion. Through the joint marketing efforts of ENC and local university, Humbolt State, our community will have a new entry point for an introduction to local paddle sports. I am hopeful that these efforts will also result in increased membership for the ENC paddle club, and greater support for paddling in my region." April Zilg is an avid paddler, an ACA Level 2: Essentials of SUP Instructor, and an ACA SUP Yoga Instructor. What started as a recreational hobby in 2009, became so much more when she got into racing. Today April is a top paddler on the east coast, placing first in several championships and in the top ten in the Carolina Cup and the Battle of the Paddle. When she’s not competing, she’s giving lessons, teaching clinics, guiding SUP yoga or SUP surfing. She teaches in Wrightsville Beach with Carolina Paddleboard Co. where she helped start the Carolina Jr Waterman's team, a program to help kids become better, safer watermen. April is a Hobie team rider and a regular contributor to Distressedmullet.com and "Local Sessions" surf magazine. April looks forward to continuing to grow as a paddler and spread the love of the sport. ACA: April, it sounds like you have had a wide variety of SUP experiences! Can you tell us about one of your most memorable trips? Zilg: Traveling throughout India in 2012, and paddling with so many different people will always be one of my top favorite trips. I gave lessons, we went on excursions to remote islands, through backwaters, and I lived with the Surfing (now also SUPing) Swamis for a few months. We packed up inflatables and traveled through the Himalayas to paddle rapids, rivers, and the highest altitude lakes in the country; my companions and I currently hold the record for highest altitude SUPed at 16,020 feet. ACA: Thanks April, and congratulations on being January 2015’s Kokatat Instructor of the month! Mike has started his own paddlesport instructional company called Midwest Paddlesport, and with the influence and guidance from some of the industry’s best, is motivated to continue passing on paddling skills and knowledge for generations to come. In 2014 alone, Mike had the opportunity to teach and paddle on Lake Superior and Lake Michigan, the waters beneath the Golden Gate Bridge, the Florida Keys, and the waters of South Carolina. You can usually find Mike paddling or teaching on the Mississippi River near his hometown in Minnesota. Mike plans to continue to share his passion for paddlesports by organizing instructional events and working with local universities and organizations. November Kokatat Instructor of the Month, Anna Levesque, is not only a gifted kayak and SUP instructor trainer, but she is also a big player in the ever growing SUP Yoga world. We had the opportunity to chat with Anna last week, to talk about her latest ventures and inspiring story. ACA: Anna, you have had the opportunity to paddle hundreds of different rivers, in 12 different countries, win multiple international competitive titles, and start multiple unique paddling businesses. How does the ACA help contribute to your continued success in the paddling world? Anna: I've been paddling for over 20 years and teaching for over 10 years, and in that time I've witnessed the power of good paddling instruction and the damage of poor paddling instruction. I feel that the ACA holds their Instructors and Instructor Trainers to the highest standards and that is good for students and good for the sustainability of paddlesports. ACA: You are one of the frontrunners promoting the ACA SUP Yoga Program (we are so excited about this new curriculum), Tell us a little about your SUP Yoga experiences thus far. Anna: Last year I launched a new program called Mind Body Paddle here in Asheville. I teach weekly SUP Yoga classes at the confluence of Hominy Creek and the French Broad, and it is wonderful! Practicing yoga on the SUP boards enhances balance, strength, and focus. It is a very peaceful, mindful, active way to be outside and connect with nature. I have an anchor system so that the SUPs don't drift for the yoga portion of class; participants also have the opportunity to improve their SUP paddling skills before and after class. I was excited to participate in the ACA's first SUP Yoga Endorsement training this summer with other amazing SUP and Yoga instructors, and I think that SUP Yoga will continue to grow. If you haven't tried it I highly recommend finding a local class! Hailing from Longmeadow, MA, Jim Sullivan began paddling canoes with his father at an early age. He fell in love with kayaking at the age of 12 at Wilderness Experiences Unlimited; he eagerly waited until he was old enough to become an ACA certified instructor. He has been working with ZOAR Outdoor, and has built an impressive paddling resume, as well as obtained several ACA certifications including: Whitewater Kayaking and River Canoeing IT, Swiftwater Rescue, and SUP Instructor. Jim has recently had the opportunity to work with First Descents, an organization that allows people with cancer to enjoy recreational activities, in an effort to outlive their diagnosis. Jim says, “It is amazing to see the impact that kayaking has on their lives. Every one of their smiles seems so important, so full of life. The memories and bonds that these students form become so powerful; it is truly great to be a part of this paddling program." When asked what his ACA experiences mean to him, Marcel provided these wise words: "I owe so much to paddlesports: my character, passions, personality, relationships, and even my life. I have always believed in a balanced life, so if I owe something or someone - I make good on my promises. I accomplish this by repaying my teachers by continuing their teachings, I honor my past mentors by becoming a mentor, and I am always trying to convey the joy I have felt (from paddling) with others who could enrich their lives through these activities. This is why I am so dedicated to experiential education and paddlesports instruction. I want not only to provide people the opportunity to learn to paddle, but ultimately learn to grow as an individual and as part of their community. The best way for me to do this, and to ensure success for these individuals, is learning how to be the best educator I can be." Thanks, Marcel! And Congrats! Omar Ramos is an ACA SUP and Coastal Kayak Instructor from Gurabo, Puerto Rico. Omar was introduced to paddling at the young age of 7 through the Boy Scouts of America. He has been hooked on paddling ever since, meeting and paddling with his mentors: Gil Hidalgo, Jose Gonzalez, and Keith Keller (also esteemed ACA Instructors). Omar started a company called Paddle Paradise Puerto Rico, whereby he provides quality paddling educational programs for the people of Puerto Rico. He has made it his mission to spread his passion for paddlesports as well as provide healthy, fun, and safe paddling experiences. Omar recently had the opportunity to host one of the ACA's USCG On Water Paddlesports Instruction Workshops, and he is once again energized to continue sharing the ACA's mission of making the world a better place to paddle! Ethan Talley of Easley, South Carolina, is an ACA Level 4: Whitewater Kayaking Instructor who uses paddling as a means to explore the natural world. Ethan particularly enjoys paddling one of the Southeast's most notable whitewater rivers, the Chatooga River, a national wild and scenic waterway that serves as the boundary between Georgia and South Carolina. Ethan was a member of the first exploratory party to venture into the Twelvemile Creek Gorge near Norris, South Carolina. This particular section of the Twelvemile was revealed in 2013 through the removal of two old, derelict dams. Ethan was also among the first paddlers to legally explore Section 0 of the Chattooga--a section of river that has been inaccessible for many years due to a long legal access battle. According to Ethan, there are many creeks in Pickens and Greenville Counties (SC) that have rarely been paddled and still remain a mystery to locals. "What makes these areas so unique is the lack of literature and knowledge of navigability on each little creek," Ethan said. "One can't help but feel a sense of personal connection to the whitewater that has barely been explored. I love the exhilarating feeling that I get when experiencing something completely new." No stranger to challenges, Ethan certainly has his hands full between obtaining his Outdoor Leadership Degree at North Greenville University, utilizing his ACA Whitewater Kayaking and Swiftwater Rescue training, and increasing his own paddling skills. Ethan's paddling accomplishments are a great example of exploration, fun, and learning--you never know when your biggest paddling adventure could be right in your own backyard! Between raft guiding, kayaking, and working as a Recreational Therapist at the Grand Junction VA Medical Hospital in Fruita, Colorado, ACA Instructor of the Month Ryan Keyes is always on the go. We were lucky enough to score an exclusive interview with Ryan, an ACA-certified river kayaking instructor, in which he reveals his source of happiness on the river. ACA: How did you get into paddlesports? Keyes: I began kayaking in college, where I was studying to become a Recreational Therapist, with an emphasis on outdoor recreation for individuals with disabilities. ACA: What drew you to becoming an ACA instructor? Keyes: Working as a Recreational Therapist, with the Grand Junction VA Medical Center, I had an opportunity to start a local Team River Runner chapter in Grand Junction, which focuses on providing therapeutic paddling sports to disabled veterans. As a Recreation Therapist, I understand the importance of certification and a standardized practice of care. Obtaining an ACA Whitewater Kayaking Instructor certification has given me the knowledge and confidence to train volunteers and teach veterans the lifelong sport of kayaking. ACA: Will you tell us about one of your favorite paddling moments? Keyes: My favorite paddling moment was on the 2013 TRR Salmon River Clinic. The 6-day/81-mile kayaking trip consisted of 13 disabled veterans from across the country paddling the Main Salmon River in Idaho. It was amazing to see a group of complete strangers transform into a cohesive team, navigate the river as a team, and overcome personal barriers to have a true wilderness experience. I am truly blessed to be a part of such a meaningful program. It brings so much joy and purpose to my life. ACA: Thank you, Ryan, for bringing your gifts to the community! Grier began her paddling career as a raft guide at the Nantahala Outdoor Center (NOC), guiding commercial raft trips on the French Broad River. Since that time, she has relocated to Kane'ohe Bay, Hawaii, where she works at Holokai Kayak & Snorkel. She is the Education Coordinator for a program called Kama'aina Kids, which provides educational opportunities for children to learn about water safety; she also works with Spirit of America to provide kayaking, canoeing, and sailing opportunities for students at local Kahalu'u elementary school. Grier's favorite place to paddle is Kane'ohe Bay, the largest bay in the state of Hawaii. She recently completed one of her most memorable paddling trips--she started from the north end of Kailua Bay, paddled to the island of Moku Manu, and returned through Kane'ohe Bay. When asked why she decided to pursue ACA certification, she said, "The ACA reputation speaks for itself, and I am proud to be a part of it!" Thank you, Grier, for making the world a better place to paddle! Raphael is one of the ACA's most active Instructor Trainers and one of the most influential ACA representatives in Europe. Born in the middle of the Black Forest in Germany in the summer of '69, it took Raphael 20 years to find his passion in paddlesports. But once he started paddling, he never looked back. Raff (as his friends call him) began seeking ACA certification in 2002 when formalized paddling education was not widely available in Europe. He was determined to find the highest quality canoeing instruction available, and in his own words, "I found the ACA and the rest is history!" On his first trip to Canada almost 15 years ago, Raff had the opportunity to spend 10 days in Algonquin National Park. Imagine a clear September afternoon, not a cloud in the sky, new and exciting scenery, just you and your canoe--Raff was amazed. He said, "As an instructor, my life changed when I ventured outside of Europe to meet all the fantastic paddlers and instructors in North America. I remember my first trip to North Carolina for a canoeing certification course at the Tuckaseegee and French Broad Rivers. Two full weeks of paddling and fun. During the course we spent some time at the French Broad River Festival, seeing the strength of the local paddling community full of excitement, friendship, and incredible paddlers--it was great!" Raff's favorite event was attending his first ACA Paddlesports Conference in 2012 in Charleston, SC. "That was another step for me as an Instructor and Instructor Trainer. The ACA was no longer an organization without a face, it became an organization of friends and great paddlers. It motivated me to keep doing what I love--teaching paddlesports--no matter if I sit, kneel, or stand upright." Don started paddling over 20 years ago but didn't get serious until his wife and partner, Fern, arrived on the scene. Together they began paddling the northeast rivers, lakes, and coast line from Connecticut to Maine. Don's first introduction to instruction was assisting Fern in teaching traditional style paddling and rolling to eager students all over the northeast. A move to the mountain biking hills of western North Carolina meant a dry spell from ocean kayaking, but the "kayak fever" never really left. Don and his wife began their periodic migrations from western North Carolina to Charleston where they were welcomed like family by Sea Kayak Carolina. With their help and guidance, Don and Fern updated their skills and, at the same time, learned to love the little slice of heaven known as Charleston. They now live permanently in the Charleston area and continue to share their passion for kayaking and for this kayaking paradise to any and all who visit. They are devoted to coaching and instructing, both as a team and as individuals with their own specific areas of interest and expertise. The most challenging and rewarding course that Don and Fern offer, as a team, is a 2 and a 1/2 day ACA instructor IDW/ICE preparation series. This program was developed to help potential instructor candidates prepare for the more formal development workshops and evaluation courses. They look forward to swelling the ranks of the ACA with skilled kayakers and top notch instructors as they continue to improve themselves in both skill and technique. Don has been very lucky to have learned from some of the best instructors the ACA has to offer, and this has helped shape his philosophy of kayak instruction. He believes the best teachers never stop learning, and every student can teach you something if you listen. Hunter is an ACA certified whitewater canoe and whitewater kayaking instructor. He can be seen paddling and instructing all over Western North Carolina, his favorite place to paddle. Class I-V, natural or dam released, wide open rivers or narrow creeks, Hunter has thoroughly explored the variety that the southeast has to offer. His hometown run is the North Fork of the French Broad River, just outside Brevard, N.C. Hunter still aspires to travel to the pacific Northwest: "I want to see the classics out there, and there is no better way to see it than by kayak and canoe!" Hunter was recently involved in a community-wide project of rebuilding a popular local play spot known as Eternity Hole. He learned a lot about the construction of a quality play hole, but he was even more impressed by the way the community came together to attempt such a project. "New school and old school boaters joined in to rebuild something that is important to all the local paddlers in my community," he said. "That was a great experience." The ACA would like to say congratulations to Hunter! Dan has been paddling for the past 15 years, and began ‘messing about in canoes’ when he was young. After being inspired by video footage of rafts on the Zambezi River, and after watching whitewater paddling in the Olympics, Dan was hooked on kayaking. After high school, Dan was not satisfied with the ‘normal’ day jobs commonly available and decided the pursue becoming an ACA certified Kayak instructor so he could share his paddling passion with others. Dan’s favorite place to paddle is the coast of Maine because it has endless spots to explore. In 2010, Dan completed one of his life-long dreams of paddling from Canada to Key West—the entire east coast! One other memorable moment for Dan was paddling in Cape Lookout, North Carolina with his then future wife, Bethany. It was the middle of the night, and the water was alight with bio luminescence . They took several hours to paddle across the sound to absorb the incredible beauty of the water. Dan is most proud of the individuals that he has had the opportunity to teach; he is always glad to see their excitement and skills develop, knowing that they will carry the sport with them forever. The ACA would like to say congratulations to Dan! The ACA is proud to announce the October Kokatat Instructor of the Month, Vernon Graham from Boiling Springs, PA. Vernon began his paddling journey with a canoe trip to the Boundary Waters in 1971, and seriously began paddling whitewater canoes and kayaks in the early 1990s. A self-described boat-aholic, he owns everything from sea kayaks and tripping canoes, to whitewater kayaks and canoes. Vernon's favorite boat is the Ocoee, as it has the best balance of turning, tracking, speed, stability, and ease of rolling of any boat that he has owned. Alongside his work with the Canoe Club of Greater Harrisburg (an ACA PAC), Vernon is an ACA certified instructor in both whitewater canoeing and kayaking. He attributes much of his success to his local friends and fellow paddlers who have provided him with the environment, encouragement, and support to constantly improve his skills. Vernon’s favorite trips have been canoeing the Grand Canyon (twice), two trips to Costa Rica with Costa Rica Rios, and a 2013 summer trip down the Middle Fork of the Salmon River. "I think my favorite moments are when I’ve managed to pull off a canoe roll in the middle of places I really, really didn’t want to swim--like the Upper Youghiogheny, and the Upper Pacuare," said Vernon. Vernon has had the opportunity to instruct for a local summer camp program for visually impaired children and he recently began teaching a crash course in whitewater kayaking to the Boiling Springs High School Outdoor Club. Nancy has always loved the water. She first visited the shores of Lake Superior working at Bay Cliff Health Camp in Big Bay, MI in 1988. On a day off, she hiked along Pictured Rocks and saw sea kayaks playing in the water below the cliffs. She knew immediately that was where she wanted to be! In 1993, when she settled in Marquette, MI, the first thing she did was buy a sea kayak. Coincidentally, that was the same year that her camp director met Janet Zeller, then president of the ACA and one of the founders of the Adaptive Paddling Workshop and author of Canoeing and Kayaking for Persons with Disabilities. The camp for which Nancy worked, Bay Cliff, is a therapy camp for children and adults with disabilities. Her background as a physical therapist and her new found passion for kayaking started merging immediately. Nancy's favorite places to paddle are just about anywhere on the Canadian North Shore of Lake Superior. It is a magical mix of towering rock cliffs and spectacular cobble, pebble and sand beaches; of rugged exposed coast and intimate coves. The water is clear and cold with great visibility. Much of the coast is protected and open to the public, but very remote and not easily accessible – meaning little boat traffic and lots of immersion in the natural world. The cold of Lake Superior has preserved some arctic plants in this area of Boreal forests and allowed a caribou herd to flourish. It is also rich in history with unexplained ancient artifacts, pictographs and more recent remnants of the fishing and logging industries along the coast. Nancy started her ACA certification process with adaptive paddling and coastal kayaking certifications: she found that teaching made her a better paddler, and being a better paddler made her a better instructor. It became a self-perpetuating cycle! The ACA is pleased to announce our June Kokatat Instructor of the Month—Steve Busch from Binghampton, New York! Steve has been involved in paddling since the 1970’s– and was first certified as an ACA instructor in 1987. He was influenced early on in his paddling career by legendary paddler, Tom Foster. Steve’s favorite river run is New York’s Fish Creek, which has over 10 miles of class III play. Steve is a retired Physical Education teacher and aquatics director, and with the help of ACA, grew his school’s paddling program to include kayaking rolling, canoe instruction, and introductory whitewater trips to nearby rivers. Steve still teaches kayaking, canoeing, and SUP as an adjunct professor at Binghampton University and ZOAR Outdoor Programs. Ron has been a paddling enthusiast for over thirty years growing up in the Great Lakes Region. After becoming an ACA Instructor, Ron formed Black Parrot Paddling, LLC and along with his wife, Suzanne, who is also an ACA instructor has taught canoeing, kayaking and SUP to hundreds of clients over the past 18 years. Ron has served in the past on the board of the Great Lakes Sea Kayak Club and as Safety Officer for the Great Lakes Sea Kayak Symposium held yearly on the shores of Lake Superior. He serves as Senior Paddlesport Director overseeing the canoeing, kayaking and SUP programs for YMCA Storer Camps in Southeast Michigan. He is presently a working member of the ACA Coastal Kayak Committee. An avid sea kayak and SUP racer, Ron can be found competing in various races from the Great Lakes to the Gulf Coast. Splitting his time between southeast Michigan and Gulf Shores, Alabama, Ron is working to establish a cadre of ACA instructors along Louisiana, Mississippi and Alabama Gulf Coasts in order to provide quality instruction resources for the growing Gulf area paddling community. Ron is a Level 5: Advanced Open Water Coastal Kayak Instructor, Level 4: Open Water Coastal Kayak Instructor Trainer, Level 2: Essentials of Canoe Touring Solo and Tandem Instructor Trainer and Level 2: Essentials of SUP Touring Instructor. Ron also holds the ACA Adaptive Paddling Endorsement. Martha has been paddling for over twenty years and she teaches paddlesports at Texas A&M University. While in her late 20’s, she took a road trip from Texas to Western North Carolina, where she fell in love with the Nantahala River and other nearby rivers. Her favorite places to paddle are the Nantahala, Chattooga, Ocoee, the Boundary Waters, San Juan Islands, and Alaska. Martha has been influenced by Chris Port, Anne Sontheimer and Jimmy Holcombe from the Nantahala Outdoor Center and attributes her success to the support and encouragement that the river community has provided her over the years. Martha is a teacher by trade and is always happy to share beautiful rivers and places with new students and old friends. Martha is from College Station, Texas and is an ACA certified Level 4: Whitewater Canoeing - Solo & Tandem Instructor, Level 5: Advanced Swiftwater Rescue Instructor, and a Level 4: Whitewater Kayaking Instructor. Chuck Conley lives in Virginia Beach and is involved in many aspects of paddling. Competitive paddling is his passion, and he races surf skis, kayaks and outrigger canoes. Recently Chuck was elected as President of the Mid-Atlantic Paddler’s Association, the competitive paddling club in Southeast Virginia. He sells Stellar surf skis and kayaks, and he is an American Canoe Association Level 4 Coastal Kayak instructor as well as a Level 3 Surf Kayak instructor and Level 2 Surf Kayak Instructor Trainer. Chuck has been an eco-tour guide and guide trainer for almost twenty years. He is also the organizer for the Hampton Roads Kayak Meet-up Group. In 2011 Chuck started Team River Runner-Virginia Beach, a non-profit organization that takes wounded warriors and their family members paddling. It has become his passion and he feels it is some of the most important work he has ever done. TRR-VB has recently become a Paralympic Sport Club which will help it reach an even larger population of adaptive paddlers. Chuck is married to Annette, his favorite shuttle bunny, and has two great kids for paddling partners. Jose Gonzalez, is am ACA Level 2: Essentials of SUP Instructor Trainer and an Introduction to Kayaking instructor. He has been teaching and managing outdoor programs for over 20 years. He has competed in multiple SUP races including the HanoHano and Battle of the Paddle race. He considers himself a recreational athlete mostly doing functional training and fitness in the outdoors in order to qualify for the Molokai 2 Oahu race. Terry is a Level 3: Coastal Kayaking Instructor with the adaptive paddling and camping endorsements. He owns Severn Kayaking, LLC in Safety Harbor, Florida. Here he enjoys the Tampa Bay area and the diversity of the Atlantic and Gulf coasts of Florida, teaching paddling and camping to newcomers in paddlesports and improving techniques for paddlers of all skill levels. He strives to remind them never to lose respect for the sea. He also works with veterans who have suffered loss of limbs and has started a quarterly program with the City of Safety Harbor establishing a place for people of all abilities to come and have fun on the water. He also volunteers with the City of St. Petersburg assisting with their Adaptive Paddling Program. Terry said people drive over fifty miles to paddle a kayak during these programs. His favorite comment from one of his students who lost an arm in Vietnam is, "I never in my life dreamed I could paddle across Tampa Bay!" Terry truly believes kayaking is a wonderful sport to pass on to anyone who wants to experience and develop seamanship skills. Steve is a Level 4: Open Water Coastal Kayak Instructor Trainer, Level 5: Advanced Open Water Coastal Kayak Instructor and Level 3: Essentials of Surf Kayaking Instructor. He is the lead paddle sports instructor for Cascade Canoe and Kayak Centers and is the Assistant Coach of the Cascade Canoe/Kayak Racing Team, a Youth Olympic Development program. Steve enjoys the dynamic diversity the Puget Sound offers. From Surfing to rock gardens and from 8 knot currents to beautiful glassy flat water, there is nothing better than being able to share this wonderful playground with paddlers of all skill levels. There is something in paddle sports for everyone! Susan is an ACA Level 2: Essentials of Kayak Touring Instructor who loves her P&H Scorpio LV. Her favorite things to do while paddling are expeditions, exploring and surfing. One of her favorite paddling trips was the circumnavigation of Cumberland Island in Georgia. She learned to kayak and was certified by the ACA Pro School Geneva Kayak. She enjoys being an ACA instructor because it allows her share what she has learned with new paddlers so they can feel confident, safe and skilled on their kayaking adventures. Ande works with the Charleston County Park and Recreation Commission (CCPRC) as the Outdoor Recreation Coordinator for Youth Programs. Starting as a camp counselor in 2003 and becoming the Youth Coordinator/Camp Director in 2007, he has a passion for working with kids in dynamic environments in order to help build confidence and encourage positive and appropriate decision making. As an ACA Instructor since 2004, he has been able to bring his same joy and passion of paddlesports to thousands of children and young adults in the Charleston area through safe practices and exciting programs. Notably, he, along with several colleagues from CCPRC and the ACA, provided the opportunity of a lifetime for numerous children from rural and underserved areas of Charleston County to learn how to canoe and take a 6 mile cruise down the beautiful tannin rich Edisto River (the longest free flowing blackwater river in North America). The teenagers' maiden voyage was a tremendous experience for all involved! Ande is incredibly gracious and honored to be chosen as the Kokatat Instructor of the Month and admits this award is a true testament for the dedication of his paddling mentors from CCPRC and the ACA! Beth is an ACA Level 4: Whitewater Canoeing Instructor Trainer, a Level 2: Essentials of River Kayaking Instructor and servers as the secretary on both the Introduction to Paddling Committee and River Canoe Committee. ACA staffer Kelsey Bracewell caught up with Beth in between courses and had the following conversation: How long have you been in paddlesports? I have been paddling, teaching, and leading trips on the water for 24 years. I was intrigued by the sport when I was a camp counselor, hearing about all the fun and excitement the week-long adventure paddlers had on the river. That program pulled me in and I haven't looked back! What is your favorite paddlesports? River Canoeing is definitely my passion. Traveling down river and navigating rapids is my favorite way to spend a day (or 2 or 3). I am expanding my horizons by recently adding river kayak instructing and looking forward to exploring the SUP discipline to paddle when I spend time on the coast. Becky has loved the water all her life and began participating in water sports as a youngster in Louisiana. After retiring from a successful career in Land Developing, she moved to Pensacola Beach. A new passion was born when she was introduced to Stand Up Paddling by her friend and mentor, Yancy Spencer III, who was one of the pioneers for Gulf Coast Paddle Boarding. After stand up paddling for 4 years,she decided to attend the ACA SUP certification course. At 60 years old Becky became the first ACA certified Stand Up Paddle instructor in the Florida Panhandle. Since then she has formed Water Warrior, LLC and has passed on her passion to more than 200 students from all over the world, this summer alone. She is very proud of her certification and the knowledge that her students have been introduced to this sport with fun and SAFETY in mind.